The Issue Queues hold dispatched Micro-Ops that have not yet executed. When all of the operands for the Micro-Op are ready, the issue slot sets its “request” bit high. The issue select logic then chooses to issue a slot which is asserting its “request” signal. Once a Micro-Op is issued, it is removed from the Issue Queue to make room for more dispatched instructions. BOOM uses a split Issue Queues - instructions of specific types are placed into a unique Issue Queue (integer, floating point, memory). Note: Current BOOM also allows for a unified Issue Queue (but only with integer and memory types). Although not yet supported, future designs may choose to speculatively issue Micro-Ops for improved performance (e.g., speculating that a load instruction will hit in the cache and thus issuing dependent Micro-Ops assuming the load data will be available in the bypass network). In such a scenario, the Issue Queue cannot remove speculatively issued Micro-Ops until the speculation has been resolved. If a speculatively-issued Micro-Op failure occurs, then all issued Micro-Ops that fall within the speculated window must be killed and retried from the issue window. More advanced techniques are also available. Instructions are dispatched into the Issue Queue. From here, they wait for all of their operands to be ready (“p” stands for presence bit, which marks when an operand is present in the register file). Once ready, the issue slot will assert its “request” signal, and wait to be issued. Fig. 7.1 A single issue slot from the Issue Queue. Each issue select logic port is a static-priority encoder that picks that first available Micro-Op in the Issue Queue. Each port will only schedule a Micro-Op that its port can handle (e.g., floating point Micro-Ops will only be scheduled onto the port governing the Floating Point Unit). This creates a cascading priority encoder for ports that can schedule the same Micro-Ops as each other. If a Functional Unit is unavailable, it de-asserts its available signal and instructions will not be issued to it (e.g., an un-pipelined divider). There are two scheduling policies available in BOOM. The first is a R10K-style Un-ordered Issue Queue. Dispatching instructions are placed into the first available Issue Queue slot and remain there until they are issued. This can lead to pathologically poor performance, particularly in scenarios where unpredictable branches are placed into the lower priority slots and are unable to be issued until the ROB fills up and the Issue Window starts to drain. Because instructions following branches are only implicitly dependent on the branch, there is no other forcing function that enables the branches to issue earlier, except the filling of the ROB. The second available policy is an Age-ordered Issue Queue. Dispatched instructions are placed into the bottom of the Issue Queue (at lowest priority). Every cycle, every instruction is shifted upwards (the Issue queue is a “collapsing queue”). Thus, the oldest instructions will have the highest issue priority. While this increases performance by scheduling older branches and older loads as soon as possible, it comes with a potential energy penalty as potentially every Issue Queue slot is being read and written to on every cycle. There are two types of wake-up in BOOM - fast wakeup and slow wakeup (also called a long latency wakeup). Because ALU Micro-Ops can send their write-back data through the bypass network, issued ALU Micro-Ops will broadcast their wakeup to the Issue Queue as they are issued. However, floating-point operations, loads, and variable latency operations are not sent through the bypass network, and instead the wakeup signal comes from the register file ports during the write-back stage. 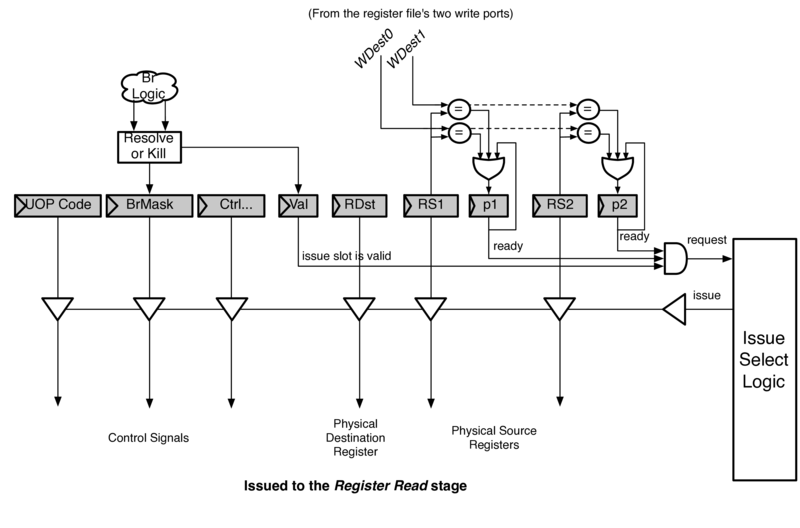 Conceptually, a bus is shown for implementing the driving of the signals sent to the Register Read Stage. In reality BOOM actually uses muxes.